A delivery fee will be added once shipping destination is determined. Representative of passionate creativity, this card is about realising your own potential. We are all creative beings and this card could be called a muse. 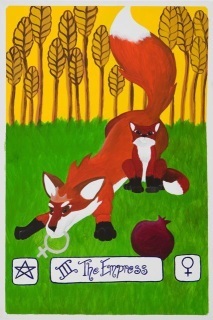 Usually depicted as a fiery red-head, I used a fox for this card in staying true to that vital colour. 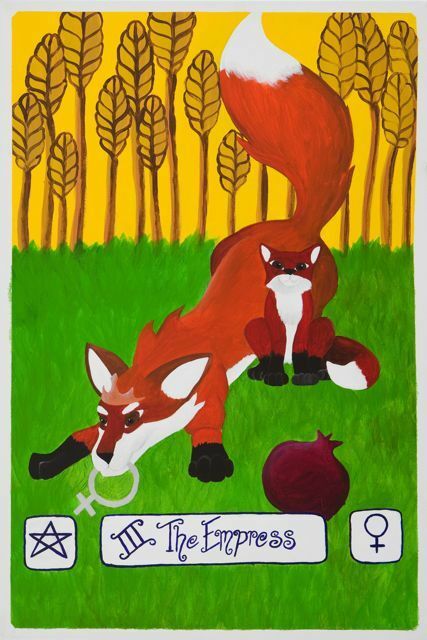 she is the mother of ideas and so there is a fox pup - an idea, next to her. She carries a gift for the creative soul. Wheat worked well for this as it shows growth and because wheat, once cultivated, can be used to create all manner of things. A pomegranate is a challenge, but with great reward, as are most creative projects. 24X36" extremely high quality reproduction on canvas, unmounted. Delivery will be charged separately depending on the size and quantity of the order.